Facebook has just filed a sixth amendment to its S-1 filing to IPO in order to provide more transparency about how the shift of its user base from the web to mobile is causing it to show fewer ads per user, which could hurt revenue in the long term. Facebook also granted about $796 million in restricted stock units to employees less than a week ago, which was in the previous S-1 amendment but wasn’t widely reported. I’ve excerpted the significant changes and embedded the whole S-1 below. Specifically, Facebook is warning investors that daily active user count is rising faster than the number of ads the site is showing, which it predicts will lead to a lower average revenue per user. As we noted when Facebook originally filed, it hasn’t proven its ability to monetize mobile yet. It now has Sponsored Stories ads running in the mobile news feed, but it can’t show nearly as many ads in this format as it does on the web, where it often shows four to seven ads per page, though less prominently in the sidebar. By injecting ads directly into the news feed, Facebook is meddling with one of the most addictive features of the site. If it shows too many ads, users could become less prone to frequent return visits, and might spend less time browsing the feed. The company must walk the tightrope, testing to see how many in-feed ads it can get away with. While on the web it can keep ad presence in the news feed conservative, on mobile this is it’s only real revenue driver. 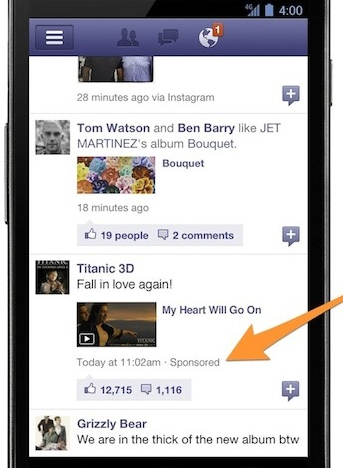 Facebook may have to slowly ramp up the frequency of mobile feed ads in order to acclimate its users. Unlike other free mobile apps that plaster banner ads over content or force users through interstitials, Facebook is trying to pioneer a less obtrusive way to monetize mobile through ads. Unfortunately, investors may be weary of weathering the process with their money on the line. Page 17: “Our culture also prioritizes our user engagement over short-term financial results, and we frequently make product decisions that may reduce our short-term revenue or profitability if we believe that the decisions are consistent with our mission and benefit the aggregate user experience and will thereby improve our financial performance over the long term. As an example, we believe that the recent trend of our DAUs increasing more rapidly than the increase in the number of ads delivered has been due in part to certain pages having fewer ads per page as a result of these kinds of product decisions. These decisions may not produce the long-term benefits that we expect, in which case our user growth and engagement, our relationships with developers and advertisers, and our business and results of operations could be harmed. The RSUS grant will serve as a reward for hard-working employees, and could be worth a ton if Facebook’s stock price pops and holders wait to sell them. It could also encourage employees to stick around after the IPO if they’re set to vest over a long period of time. Kim-Mai Cutler has deeper analysis about what this RSUS grant means. I’ve learned that analysts at Facebook’s first IPO roadshow events have been especially concerned about how Facebook’s ad business will be impacted by the shift to mobile. Adding additional transparency to its S-1 is Facebook’s attempt to be up front with critics. By showing it recognizes the problem rather than sweeping it under the rug, investors could be more confident the company will come up with a solution.